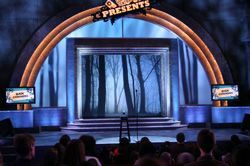 NEW YORK, NY-- Scharff Weisberg supplied a lighting package to DP and lighting designer Alan Adelman for Comedy Central Presents, the cablenets stand-up comedy series now in its twelfth season. Comics appearing last season included Marc Maron, Lisa Landry, Tom Papa, Paul F. Tompkins and John Heffron. The new shows, also featuring an array of leading comics, were taped live onstage at Manhattans Hudson Theater over a one-week time span. This was my first year doing the show, and the lighting plot was somewhat large because we shot two or three comics a day in multiple set ups, explains Adelman. We gave a different look to each comic by changing scenery upstage to provide different backgrounds. The overall look of the set, designed by John Yeck, was that of a large arch encompassing a big translucent light box with a smaller interior proscenium area, which was used for custom sets for each comic. The arch was treated like a cyc because of its translucency, Adelman says. Lighting for comedy is all about the waist-up shot: making sure the comic looks good, that the facial features are well lit. Thats why the upstage enter area is so important. Scharff Weisberg supplied VARI*LITE 500 tungsten washes in its large moving-light complement which, along with Color Blast 12 LEDs and Coemar PARs, filled the theaters small space. Scharff Weisberg did its usual great job, Adelman reports. Ive been using more and more LED fixtures and like them for their versatility in terms of color mixing and for their low power consumption. Adelman, who frequently works with Scharff Weisberg, has numerous credits as a lighting designer, including The DEF Comedy Jam for HBO, The Mark Twain Prize with winners Billy Crystal and Steve Martin, Great Performances: Dance in America for PBS and live concert specials with Jay Z and Eminem for SHOWTIME. Earlier this year he called on Scharff Weisberg when a second season of HBOs P. Diddy Presents The Bad Boys of Comedy got underway at the Brooklyn Academy of Musics Harvey Theater.